Peru election: Who are the main candidates? 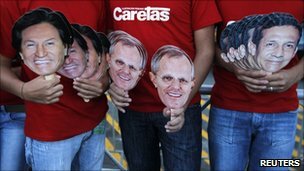 Peru is holding a presidential election on 10 April to choose a successor to Alan Garcia, who cannot stand for a second term. If no candidate wins more than 50% of the vote, a second round will be held on 5 June. In total, 10 candidates are standing, and five have a realistic chance of making it into a run-off. All have promised to sustain Peru's economic boom, while tackling poverty and crime. Opinion polls have been changing rapidly in the run-up to the vote, and Peru has a tradition of electing political outsiders. Congressional elections are also taking place. 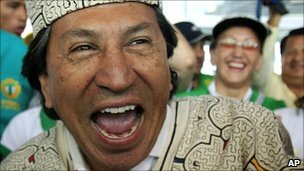 Alejandro Toledo, 64, was born into poverty in the Andean highlands but went on to become Peru's first president of indigenous descent from 2001-2006. A former shoeshine boy, he won a scholarship to study in the US and developed a successful career as an economist, working for the World Bank and other major international bodies, before returning to Peru to enter politics. He came to international prominence as a leader of opposition to controversial President Alberto Fujimori in 2000. After Mr Fujimori fled to Japan in the face of a corruption scandal, Mr Toledo won the presidency in 2001, narrowly beating Mr Fujimori's predecessor Alan Garcia, who is Peru's current president. Mr Toledo was hugely popular when he took office and oversaw five years of strong economic growth. But his approval ratings plummeted in the face of scandals over a party lifestyle and his reluctance to recognize a daughter born outside marriage. Known as El Cholo - the Indian - because of his distinctive indigenous looks, he has emphasised his humble origins and rags-to-riches life story, a personal narrative with which many Peruvians can identify. During the campaign he took a drugs test to dismiss continuing rumours about his private life. Keiko Fujimori, 35, is the daughter of controversial former President Alberto Fujimori, who led Peru for a decade from 1990 until he fled into exile in the face of a corruption scandal. Regarded by many as an authoritarian strongman who trampled Peru's democracy, he is now serving a 25-year jail sentence for bribery and ordering death squads to kill suspected Maoist rebels. Keiko Fujimori has defended her father's record in defeating the Shining Path rebels and saving Peru from hyperinflation and economic collapse, and has the backing of his remaining supporters. Like her father, she supports free market economic policy and advocates a tough approach to crime. In 1994, Keiko Fujimori became Peru's First Lady after her father and mother separated, and in 2006 she was elected to congress. 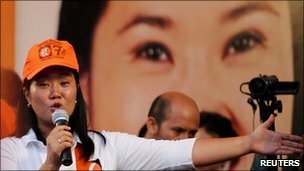 If she wins the election, Ms Fujimori would be Peru's first female president. Critics say her main aim is to secure a pardon for her father. Luis Castaneda, 65, served two terms as mayor of the Peruvian capital, Lima, from 2003-2010, and left with high popularity ratings. He has based his campaign on his strong record in running the city of around 8 million people, and the numerous public works he delivered. But an early lead in the polls last year disappeared after Lima's new mayor, Susana Villaran, released details of alleged over-spending and infrastructure projects that were poorly executed. He has dismissed the accusations as politically motivated. Sometimes known as "the mute" because of his reluctance to speak to the press, he has a strong following in Lima and in his native Chiclayo in northern Peru. Left-wing nationalist Ollanta Humala, 47, first came to prominence in 2000 when he led a short-lived military rebellion against then-President Alberto Fujimori. In 2006, the former army colonel came second in the presidential election run-off to Alan Garcia. His left-wing views won widespread support among Peru's poor majority, but worried the upper and middle-classes and led some to compare him to Venezuela's Hugo Chavez. This time he has adopted a more moderate stance, warning Mr Chavez not to interfere and emphasising instead a desire to emulate Brazil's governing Worker's Party. He says he would expand the state's role in the economy and extract higher royalties from mining companies that account for more than half Peru's exports, and use the money to reduce poverty. Like Alejandro Toledo, his humble background and indigenous looks give him strong appeal to ordinary Peruvians. His critics worry he would move Peru in a more populist, authoritarian direction and damage the economy. Mr Humala has been accused of committing human rights abuses during the fight against Shining Path rebels in the 1990s when he was an army captain, but he has denied the allegations. Pedro Pablo Kuczynski, 72, is a former investment banker, and IMF and World Bank economist. Having served as finance minister and prime minister during Alejandro Toledo's presidency, he claims some credit for Peru's booming economy. He has promised to eliminate extreme poverty within 10 years and double education spending while also cutting taxes. The son of a German migrant, he is married to a US woman and has lived much of his life outside Peru. His economic expertise has won him support among Peru's business community and international investors, but his critics see him as a representative of Peru's rich, white elite. During the campaign, he said he was giving up his US joint nationality to reassure voters that he did not have divided loyalties. 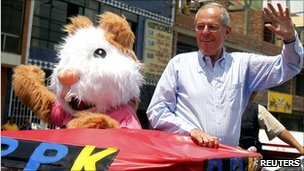 Often referred to by his initials - PPK - he has softened his image by playing the flute at rallies and campaigning alongside a man dressed as a giant guinea-pig.